To get there go east on US Highway 62/82 from Lubbock past Idalou but not so far as Lorenzo and turn north on North Farm to Market Road 789 for about seven miles then turn east on Farm to Market Road 1527 for two miles. There is nothing present in Estacado that relates to the period of its founding. A shuttered cinder block Baptist Churchand an operating cotton gin, the Medlock Estacado Gin, and six nearby residences appearamidst prosperous farming.http://www.texasescapes.com/TexasTowns/Estacado-Texas.htm A historical marker was erected in 1936 for the site of Estacado. Abbe reports that George M. Hunt was managing a small hotel at Estacado when Frank Wheelock lured him away to come to Old Lubbock/North Town and manage the Nicolett Hotel. Lorenzo is in Crosby County. In 1909 the Santa Fe Railroad was extended south from Plainview to Lubbock and the future of the town was established. Slaton became a major station on the Amarillo to Sweetwater line in 1911. Sixty-four miles of unused right of way was re-opened in the 1990s as Caprock Canyons State Park Trailway System from Estelline in the rolling plains at U.S. Highway 287 to South Plains in the high plains on the Caprock north of Floydada on Texas Highway 207. The Fort Worth and Denver South Plains Railway Lubbock depot is the western portion of the current Buddy Holly Center at Crickets Avenue and 19th Street and that depot is the namesake for the city’s Depot Entertainment District. 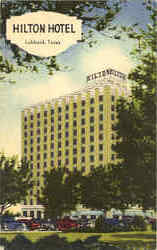 Lubbock Hotel was built in 1925 as a six story structure, later added five stories, was renamed Pioneer Hotel, and is currently being redeveloped into Pioneer Hotel Condominiums by McDougal Companies. A Pictorial History of Lubbock, Texas, 1880 – 1950 (eds. William C. Griggs et al., Lubbock County Historical Commission 1976) Lubbock Public Library R976.406 G857. It’s also interesting to trace the history of hospitals. The first Lubbock Sanitarium (1912) was built by Dr. M.C. Overton and operated by Dr. Clayton until 1920 when it was renovated to become the Saint Francis Hotel with Clark Smith as hotel manager. That building was razed after the May 11, 1970 Lubbock tornado. The second Lubbock Sanitarium (1918) at Broadway Street and Avenue L opened with 25 beds, was renamed Lubbock General Hospital in 1941 then Lubbock Memorial Hospital in 1945 and ultimately demolished and replaced by Dunlaps department store that was later renovated to become First Federal Savings & Loan Association and is currently an office building for several entities. This Lubbock Sanitarium was the predecessor of Methodist Hospital that opened in 1954 on 19th Street and is a part of the current Covenant Health System. Plains Hospital and Clinic was founded in 1937 as a ten bed facility and was named St Mary of the Plains Hospital in 1939 when it was purchased by the Sisters of St Joseph of Orange, which moved it in the 1960s from its initial 2605 19th Street location to the present site of Covenant Medical Center – Lakeside. The merger of St Mary of the Plains Hospital and Lubbock Methodist Hospital System created Covenant Health System with its constituent hospitals. West Texas Hospital (1922) was built at Main Street and Avenue L. It was demolished and replaced by another West Texas Hospital in the 1950s that was converted to offices and classrooms in the 1990s. Adjacent to it was built Llano Specialty Hospital with 30 beds at 1409 9th Street. Concord Medical Group is not itself a hospital but supplies independent contractor physicians to rural hospitals including Castro County and Bailey County Hospital Districts in Dimmit and Muleshoe. www.concordmedicalgroup.com TrustPoint Hospital and Texas Specialty Hospital are adjacent at 4302 Princeton Street south of Clovis Highway and east of North Quaker Avenue. Grace Clinic is at 4515 Marsha Sharp Freeway while Grace Medical Center is located at 2412 50th Street, the former Highland Hospital. Sunrise Canyon Hospital is a mental health and substance abuse specialty hospital. Joseph Alvin Chatman, M.D. came to Lubbock in 1939 and in 1945 became the founder and owner of Chatman Hospital at 2301 Cedar Avenue east of Avenue A at 23rd Street. http://www.lubbockcentennial.com/Landmarks/041308.shtml Remember When? A History of African Americans in Lubbock, Texas (ed. Katie Parks, PrinTech at Texas Tech University 1999). It is now operated as Chatman Community Health Center by Lubbock County Hospital District as an adjunct facility within the UMC Health System. Plains Funeral Home on Broadway Street was renovated to become the current Lubbock Women’s Club. The Institute for the Study of Western Civilization at Texas Tech University has announced its speaker series for Fall semester 2013. http://www.depts.ttu.edu/honors/westernciv/upcoming_events.php All these events are free to the public. The offices of the Institute are in the Honors College in McClellan Hall east of the Student Union Building. Escondido Theatre is in the basement of the Student Union Building. At the website there is an invitation for people to contact the Institute and if you do so you will be on its mailing list for notification of speakers and other events.